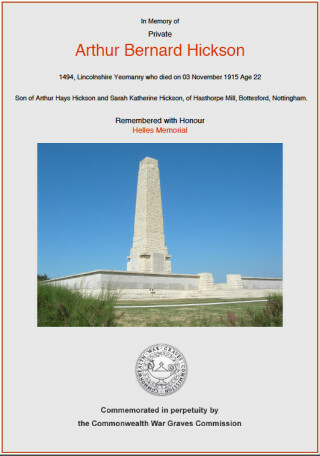 Arthur Bernard Hickson was born in 1893/1894 in Bottesford. His parents were both born in Bottesford Arthur Hays Hickson in 1856 and Sarah Katherine Hickson in 1862. Arthur Hickson was a farmer and miller. The Hicksons lived at Easthorpe Mill, Grantham Road. Both Bernard and his sister, Doris Katherine Hickson (born 1897 were at school. Ten years later In 1911 Doris was at school in Malvern and Bernard was assisting in the family business on Grantham Road. Bernard’s father was a prominent member of the community both as a Parish Councillor and Church member. 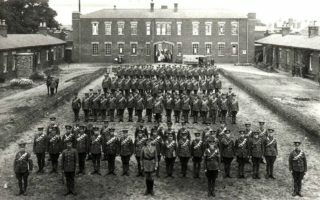 On the declaration of war he was active, alongside Canon Vincent-Jackson, Rector of Bottesford, in mustering the young men of the village to volunteer. Both families suffered the loss of their sons in action. Bernard Hickson joined the Lincolnshire Yeomanry to serve as a Trooper. In August the 1/1st Lincolnshire Yeomanry moved under orders of 1st Mounted Division to Norfolk. On October 27th 1915 they embarked at Southampton for Salonica. 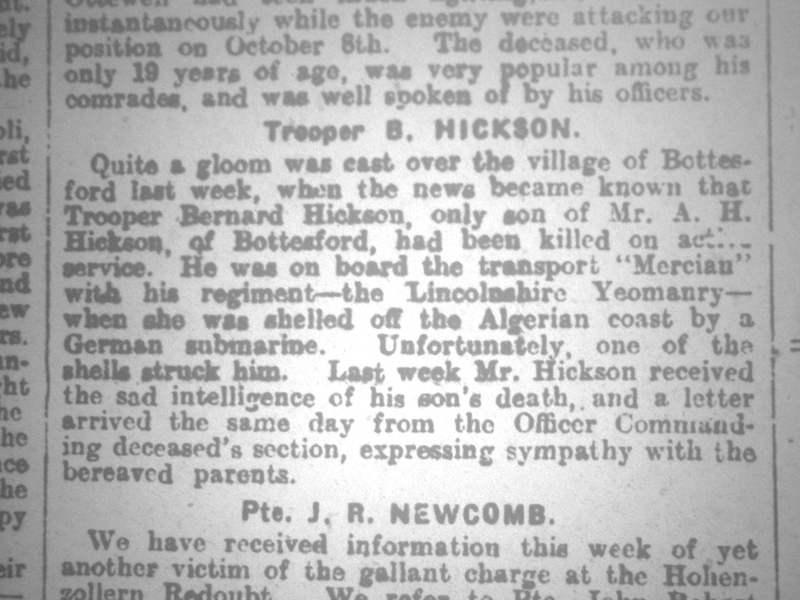 Bernard Hickson was part of that transport on board the S.S. Mercian. The ship encountered very rough weather in the Bay of Biscay and both men and horses suffered badly from seasickness. The Mercian briefly put into Gibraltar, but the troops were not permitted to go ashore as there were concerns about security. The Mercian set sail again on 3rd November under very favourable weather conditions and a calm sea. The soldiers took the opportunity to relax in the sun, clean their equipment and do their washing. In the afternoon an enemy submarine (U38) attacked the ship in the Mediterranean off Gibraltar. Over 100 men and many of their horses were killed. 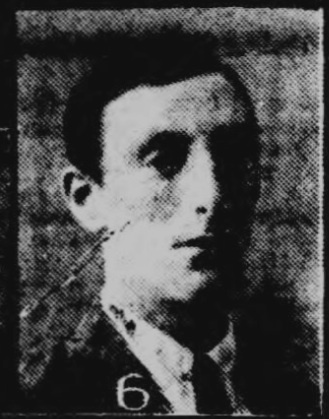 Bernard Hickson was struck by a shell and was killed. The S.S. Mercian’s Captain took evasive action and the ship eventually survived the attack and headed to Algiers for repairs. Those lost in the attack were buried at sea. After repairs at Oran in Algeria the S.S. Mercian sailed for Alexandria rather than Salonica. Bernard Hickson is remembered at the Helles Memorial (Part X11) Canalikale, Gallipoli, Turkey and on the Bottesford War Memorial in St Mary’s Church. 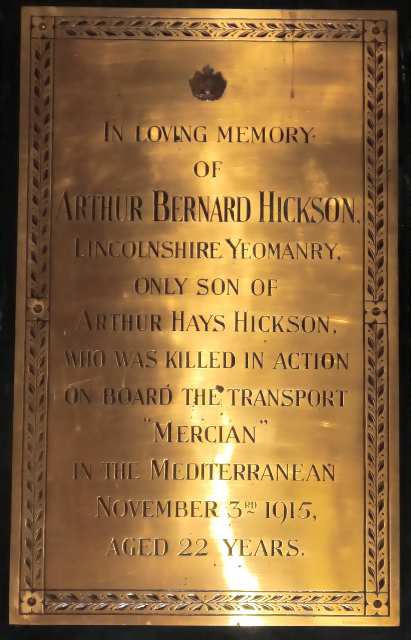 His family also erected a plaque in St Mary’s Church Bottesford in the Lady Chapel. 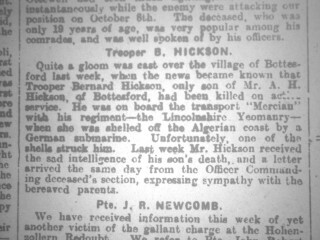 Bernard Hickson had survived just one week of active service.